A plant identification service is offered to individuals, nurseries, consultants, universities and other institutions. The aim is to provide accurate identification and provide taxonomically correct scientific names. A handling fee is charged for this service. Only labelled, good quality specimens, which are fertile (have flowering and/or fruiting parts) will be accepted for identification. Plants that can be identified include all flowering plants, ferns, cycads, cultivated and exotic weeds, as well as mosses and liverworts. Algae, lichens and fungi (mushrooms) cannot be identified at this institute. Identifications from photos will not be done, unless accompanied by a physical specimen. * Please note: the handling fee charged for identifications might be reviewed and changed periodically. The Herbarium collection is available for outside researchers, botanists and bona-fide botanists to conduct self-help identifications. Only the Quick Guide will be available for this purpose. We suggest that visiting researchers who wish to use the collection make an appointment at National.Herbarium@sanbi.org.za to ensure that the appropriate staff member will be available. Specimen exchange and loan agreements with other herbaria are arranged. Loan requests should be made in writing using an official letterhead with a full project motivation, which can be emailed / posted to the curator. For address details go to Herbarium contacts. Once approved, the selected material will be sent. A set of conditions governing loans will accompany each loan. Type specimens will not be sent unless specifically requested. High-resolution images of all the types held in PRE are available from the African Plants Initiative (API) which can be accessed via the JSTOR website. The Biodiversity Information Management section can be contacted for data requests, such as plant lists, distribution maps and other taxonomical information. A fee might be asked for the extraction of the data. 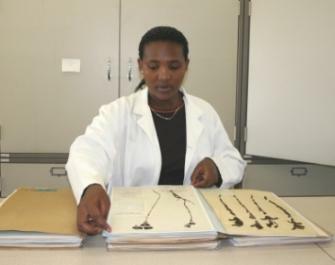 The National Herbarium has an important role to play in the promotion and advancement of plant science and taxonomy. 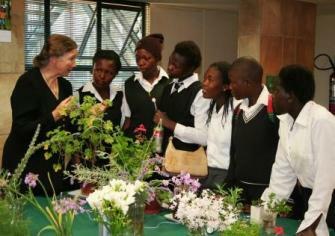 Staff participate in outreach programmes during special events such as Arbor Week and Science Week. In order to secure future botanists for South Africa, learners are encouraged to become aware of the diverse careers that focus on plants and related disciplines. The herbarium encourages scientists from other institutions to establish contact and working interactions with our scientists. 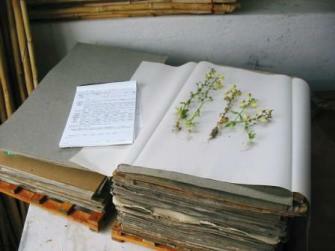 The herbarium is open Mondays to Fridays from 08h00 to 16h30. It is closed on weekends and public holidays. Please liaise with the scientists or contact National.Herbarium@sanbi.org.za for an appointment to visit. For visits or bookings please call +27 (0)12 843 5000 (switchboard) and ask for information officer or email National.Herbarium@sanbi.org.za . Visitors should ask for the Herbarium Information Officer at reception on arrival. To prevent insect infestations all incoming plant material will be kept in the herbarium freezer for at least 48 hours. Alternatively, the material will be microwaved for one minute. Herbarium specimens must be handled with care at all times. Visitors who do their own identifications are allowed to work in the Quick Guide only, unless assisted by the scientist in the wing or the Wing co-ordinator. School groups and interested persons are welcome to make a booking for a tour of the herbarium to have a look behind the scenes. There are no costs involved. The Herbarium is open for guided tours by prior appointment only.